Please fill in the short form below with your question, either about the Simrad R3016 Radar Control Unit, or for some technical advice. Please include details of your vessel if you feel they will help us answer your query. Engineered to serve in non-SOLAS applications aboard coastal and offshore fishing vessels, crew boats, tugs and other workboats, the R3016 offers versatile flush or bracket-mount installation options and intuitive keypad-based operation for reliable control in all conditions. The R3016 was engineered to meet the need for a dedicated Radar Control Unit to serve in non-SOLAS applications aboard commercial vessels, bringing a professional-grade radar interface to the unapproved radar category. 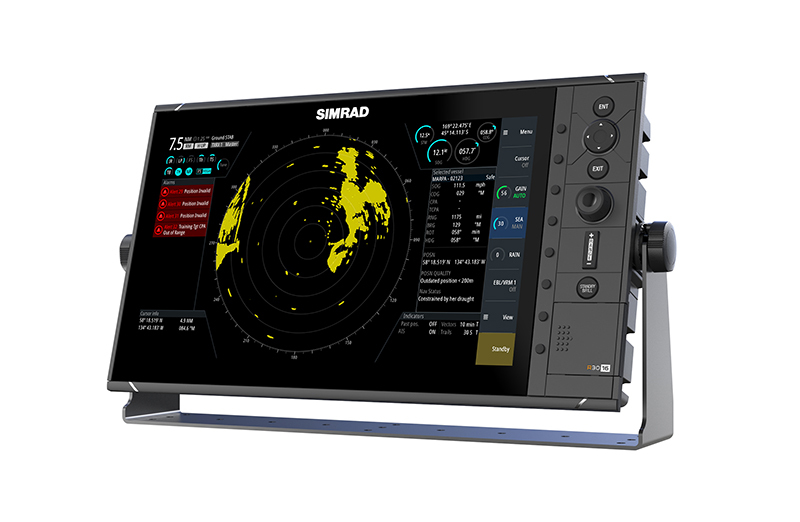 The R3016 is well suited to a variety of applications such as navigation, docking, anti-collision and anti-piracy – providing an always-visible, easy-to-operate radar display. 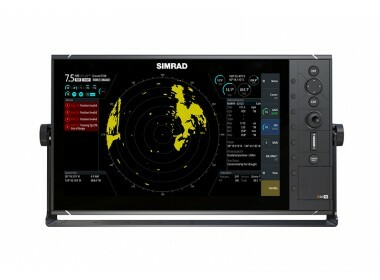 With a wide 16-inch widescreen display, the high-definition provides you with a large and detailed PPI: excellent for docking, anti-piracy, and other radar applications where small on-screen details are crucial. The widescreen format offers ample display space for alarms, indicators and target tracking information, and allows settings to be modified via on-screen menus without obscuring any part of the main radar display. The R3016 may be flush mounted, ideal for installation aboard new vessels. Alternatively, the included gimbal bracket is well suited to outside installations or pilothouse refits. With watertight rear connectors, the R3016 is IPX6 water-resistant from all sides, in either flush or bracket-mount installation. The R3016 is operated by an integrated keypad and rotary dial. Direct-access menu keys beside the display operate adjacent on-screen menu options, for quick and intuitive access to key settings and features. With reliable, long-life operation and clear tactile feedback, the R3016’s large buttons are suitable for use in rough seas, while travelling at speed, and with wet or gloved hands. 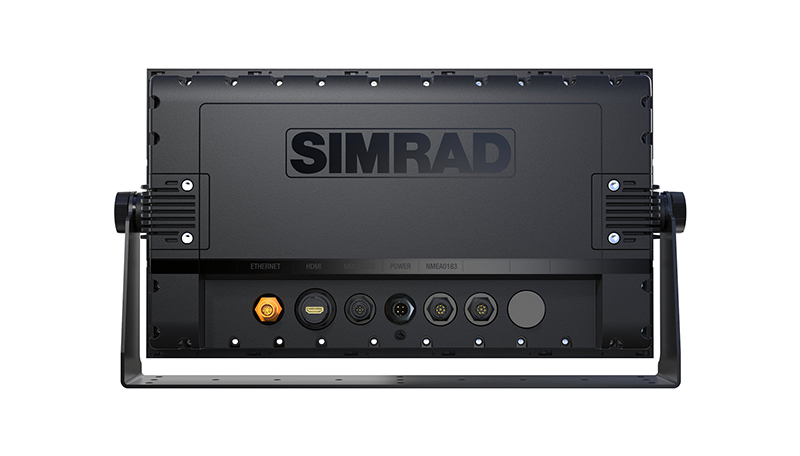 The R3016 Radar Control Unit connects to compatible Simrad radar systems via Ethernet, offering simple installation and easy networking of multiple control units and radar systems. The R3016 also provides four NMEA 0183® ports and NMEA 2000® connectivity for compatible devices such as heading and speed sensors, AIS, and GPS. An HDMI output gives the option of a secondary monitor mirroring the R3016’s primary display. This may be used to add a second non-interactive radar display at another station, or combined with the optional Simrad O2000 Controller to create a remotely operated, fully functional clone station ideal for dual-helm vessels. 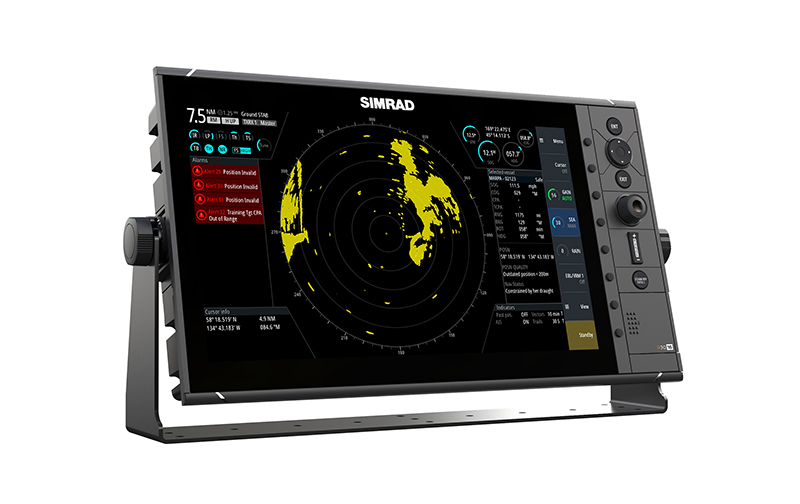 The R3016 is compatible with Simrad MO-series marine monitors, and other standard HDMI-capable displays.